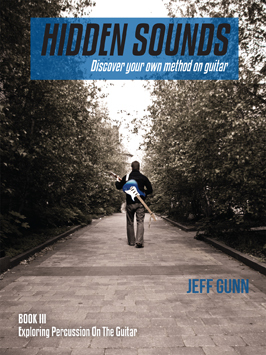 Using the Touch, Shape, Move Guitar Method, the Hidden Sounds Series includes a Quick Reference for beginners, a section on the History of the Guitar, and a Glossary. Every chapter offers a brief history of the technique in question, an explanation of how to perform the technique, a series of examples and excerpts from original pop, rock, jazz, folk and world music compositions that demonstrate the practical use of techniques, and, finally, a challenge for the guitarist to expand these exercises and make them their own. Book III, Exploring Percussion On The Guitar, expands on the techniques, exercises and excerpts in Book I and Book II and requires the guitarist to think of the guitar as a percussive instrument. We examine the percussive zones of the guitar from the strings to the neck of the guitar in a variety of styles of music from Reggae to Rock.